MUMBAI, March 25 (Reuters) - Titan Industries Ltd (TITN.BO) has utilised about half of its planned capex for FY09 as a slowdown in consumer spending hurts demand, and will proceed cautiously with expansion plans for FY10, a top official said. "Our original budget for the year was about 112 crores (1.12 billion rupees), we have utilised about half of that," Managing Director Bhaskar Bhat told Reuters over the telephone, late on Tuesday March 24. The watch and jewellery retailer plans to add about 100 stores in FY10, but would study the market carefully before launching new outlets, he said. "We will expand provided we get the right rent and manpower...expansion plans will continue in a calibrated manner", he said, adding the firm was yet to set a capex budget for FY10. "I would not say it (growth) has not got impacted, some segments are affected, the overall growth rate has come down," Bhat said. The company sells several watch brands including the economy brand Sonata and the more premium Titan brand. It also has two jewellery retail chains, Tanishq and Goldplus, and an eyewear chain Titan Eye+. Revenues in the high-margin watch segment were hit by lower consumer spending, while volumes in the jewellery business had suffered due to higher gold prices, he said. Bhat expects overall revenue growth for the fourth quarter to fall by 10 percent on year. Titan derives a majority of its revenues from the low-margin gold business. 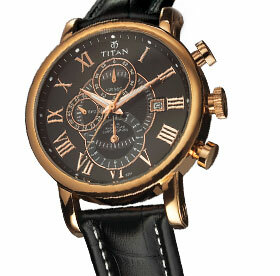 The company plans to increase product prices of its watches and eyewear products in FY10, Bhat said. "We are protecting margins by either price or volume increase, so bottomline is protected. We are able to pass on cost escalations to the consumer," he said. "We have not taken a recent price increase. We will take one price increase in FY10, (for watches and eyewear)". The Bangalore-based firm, which expanded its Titan Eye stores to close to 70 in 2008/09, plans to slow the pace of expansion of these outlets in FY10. "Most of the expansion in eyewear business happened over the past year...we are slowing down the pace of outlets. So next year we will add 20 or 30 stores," he said. "We have to be careful, because if the slowdown continues the breakeven goes up by another one year," he added. The eyewear segment, currently a loss-maker, will take two to three years to break even, Bhat said. Titan is expanding its portfolio of Fastrack stores to 50 by the end of FY10 from just two at present, as it seeks to target urban youth through its product offerings of watches and fashion accessories. "Expansion would certainly be in urban India, it will include the metros, essentially where the urban youth is located," Bhat said.